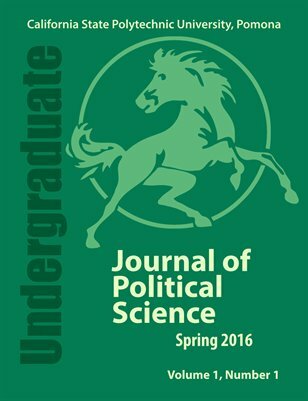 The premier issue of the Undergraduate Journal of Political Science, published by the Department of Political Science at California State Polytechnic University, Pomona. Volume 1, Number 1, Spring 2016. This issue features “Closing the Justice Gap” by Joshua Ebiner, “Environmental Racism” by Elena Ruiz Ramirez, “Solar Power” by Steven Tinsley, “Social Media and Presidential Elections” by Alexis Ojinaga, “The Egocentric Presidency” by Travis Barrett, “U.S. and Saudi Relations Under George W. Bush” by Thomas Davis, “Migrants and Europe” by Melissa Petersen, “Women and Terrorism” by Natalie Reyes, and “The Athenian Model of Representative Democracy” by Anthony Haddox. Special thanks to Editor-in-Chief Tara Kwan, Production Designer Jane Pojawa and Faculty Advisor Dr. Mario Guerrero. © 2016 All rights reserved.